Most of the time, I face problem in installing Apache2 in Ubuntu 14.04. I do google and google and eventually I can set up the Apache2 server. So, I think I should start blogging about Web server. Then go to: http://localhost , you will see a page of Apache2. Installation is nearly complete. 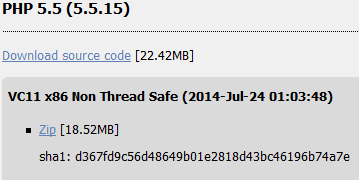 Now we have to tweak some settings so that we can edit and create file at webroot easily. Our document root is pointed to /var/www/html, but here we can’t edit file without sudo access, So to ease the process of developing we need to change the document root! So, Change the Document root! Ok, We need to restart the server to take the change affected. This is a tutorial on how to install PHP and MySQL onto Windows 8.1 using IIS for development purposes, and without using additional software platforms like XAMPP, ZendServer, or EasyPHP etc or using tools like Microsoft’s Web Platform Installer. I’ve skimmed through over a dozen books on PHP & MySQL, and none of them show you how to install them, mostly because it’s not the typical approach given the tedious configuration. Add the PHP installation path to your Environment Variables path (do not forget to prefix it with a semicolon). –If we add same type of fields in one table. –All attributes(non key elements) must be directly associated with the primary key. In your development project you might need at some point in time to create a Query String Parameter. But there are some challenges if you want to pass this to a Form Variable ! 1. Create a Query String Parameter any string is fine. and construct your URL. 2. Create a JQuery function for the receiving party. We call it as well HeaderID and refer to the Query String Parameter called HeaderID. This does NOT work for a Item Display Form a DVWP ? 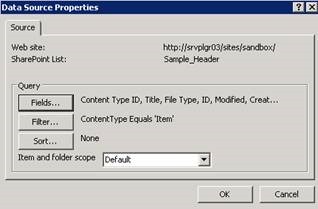 SharePoint – Convert Drop Down Box in a New Item Form to Text Box. It is possible to Convert drop down box in a NEW form to Text Box. Even if the list field type remains a Dropdown Box. This can only be achieved if in a CUSTOM List Form ! Not on a standard List Form created from the menu. Change the dropdown to a Text Box now we can. 3. Set the value on load. Now you can set the field value using a Query String Parameter value. This is not possible if we use the original Dropdown field (at least in an easy way). Keep in mind EACH WebPart has a separate Data Source Field, Filter and Sort Settings ! 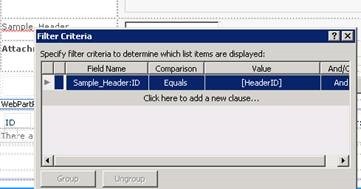 First Create a New Parameter value based on a Query String Variable. The result is that the data in DVWP will be filtered on load, by the Query String variable. Second Example is to Filter a DVWP based on a Field value. Based on the Query String Parameter you can filter the detail list web part for the items added. It will look like this. There is some garbage appearing on top of the DVWP ? Just open the Form again in SP Designer and comment out that section to get rid of it. Filtering is quite handy !